My earliest foray into birding and photography occurred simultaneously back in 1977. I landed this great summer job working on cataloguing and photographing birds in a study area as part of an environmental impact study in northeastern Alberta. I was thrilled with both of these new adventures, photography and birding. Forty years later and I am still thrilled with birding and bird photography. Over the years I can recall a few unique sightings of birds that I made which were particularly memorable. The sightings were not necessarily rare, but for the area I live they were exciting to me. As has been pointed out by others, birds have wings and sometimes they fly off course and end up where they shouldn’t be. Other times they are birds who are the “early adapters” of their species and are testing the limits of what is possible for their survival. So, one of my first unusual sightings was literally in my back yard. A Lark Sparrow showed up with some other sparrows at my feeders in late April. Lark Sparrows are common in the southern part of our province but not so much in the northern foothills of Alberta. A few years later I located a Brown Thrasher north of Hinton, again not a rare bird but “unusual” for this region. Similarly I identified and photographed a Whimbrel in Jasper National Park. I was told that this was the first sighting of this species in the park. There have been other surprising sightings; a leukistic Raven, A Crested Caracara in Jasper Park, a Lewis’s Woodpecker in the David Thompson region, a Snowy Owl in southern Saskatchewan in July. This fall I spent some time birding along the Athabasca River in Japer National Park. I was looking for shore birds and I ultimately had some success (within the “New Photos” Portfolio you will find a collection of Shorebird photos exclusively from this fall). However, the highlight of the fall migration from this location for me was identifying some Sabine’s Gulls. According to “Birds Of Alberta” Fisher and Acorn, p172 ”One reward for persistent birdwatchers in Alberta is to finally see a Sabine’s Gull - it is a great-looking bird, and a real rarity.” These birds migrate from the Arctic nesting areas to the Pacific Coast and are sometimes spotted during migration in September. Dumb luck put me in the right place at the right time. Here are a couple of photographs of the Sabine’s Gulls I was so happy to see. In summary, one of the enjoyable aspects of birding is that you never know what you might see so you always have to remain alert to the possibility of spotting something really cool! I recently managed to photograph my holy grail, the cougar (Puma concolor). 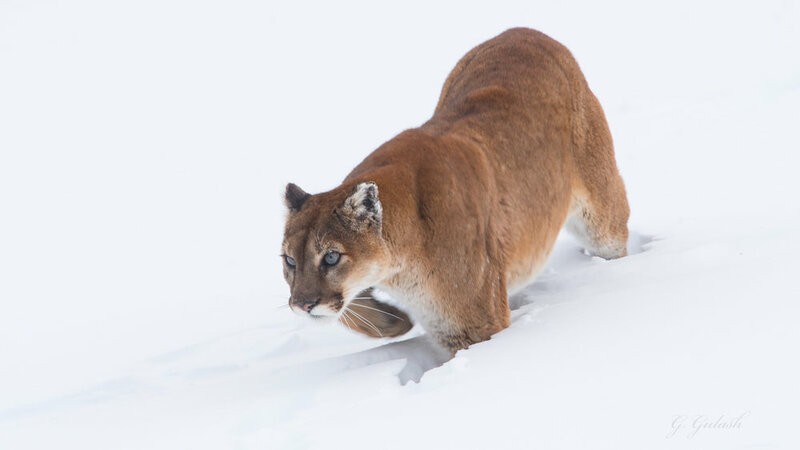 The cougar goes by many different names in the various habitats it is found in from Yukon to Patagonia. Interesting that the Chicksaw name for this animal "Ko-Icto" means "Cat of God". Cat of God indeed, second largest cat in the Americas after the jaguar. I saw my first cougar in April of 2016 while returning from Grande Cache north of Hinton, Alberta. The cougar leaped out of the ditch on one side of the road and within a few seconds pounced into the bush on the other side of the road. I didn't have enough time to even reach my camera that day, but at least I had seen one and could personally confirm the existence of these amazing creatures - in my proverbial back yard. A year later while out driving in a March snowstorm I spotted a large adult male cougar resting about 30 yards from the road. I was able to get some photos of him hunkered down in the snow and some with him perched on a rocky outcrop. This encounter will certainly be a hard act to follow! I believe the cougar has buried his kill under the bank of snow visible in front of him, either an elk or a Bighorn Sheep. This cougar has some damage to his ears as can be seen in this photo. Mountain Lion in a "mountainous" environment. On a trip to Jasper National Park this fall I had a strange "hunch" that a particular place along the Athabasca River was calling me to be explored. I debated what equipment to pack, hmmm, 600 or 200-400, or go ultra light 70-200 no tripod. As I pondered this most basic decision I spotted an eagle in a tree, ok decision made, 600 mm super telephoto. Rather than going straight to get a photo of the eagle I thought it would be a good idea to look a bit further. Quite often scavengers, ravens, coyotes and eagles around here, indicate the presence of a kill of some sort that is the big attraction. So, walked a little further and spotted a wolf moving at a good pace along the dry river bed. The wolf was focused on something in a pile of sweepers on the shore of the river. A flock of ravens had gathered by this time as well. The wolf had a radio tracking collar fitted on the neck as can be seen in the photo below. Soon a couple of coyotes came flying out of the brush pile with the wolf in hot pursuit. I guess young coyotes can be on the menu of a wolf if need be. My hunch about this area along the Athabasca had payed off. I don't know what prompted me to stop and check out this area, wildlife photographers's intuition I guess? 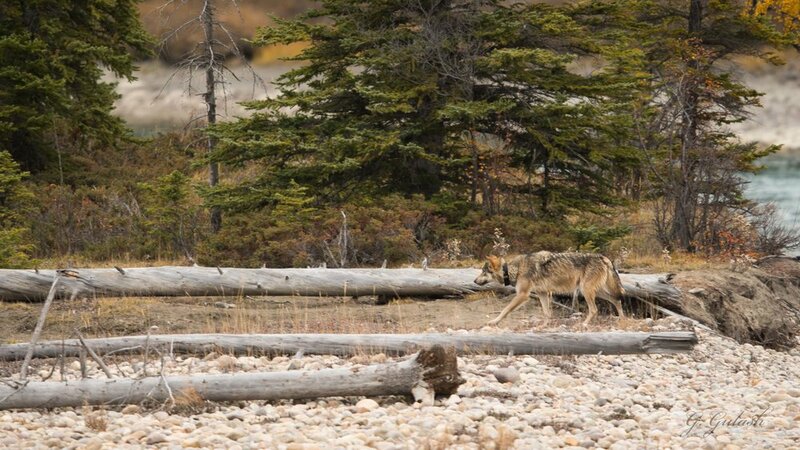 Below are some photos of the eagle, the wolf and the wolf chasing one of the coyotes. I didn't get in close to see what the source of the carrion was, but I did confirm that there was in fact a dead animal present at the centre of all the action. Another photo (below) taken earlier the same day I believe also demonstrates this idea of exposure for emotion, intimacy and "effect". Truth be told, I have found that I may prefer low key photos, those moody sort of images with deep shadows and rich jewel-like colours either in the cool or warm end of the spectrum. At this time of year sunrise is pushed back later into the morning and I had the opportunity to catch the light as it rose over the hill and just kissed the head and antlers of this Mule Deer in strong side lighting. 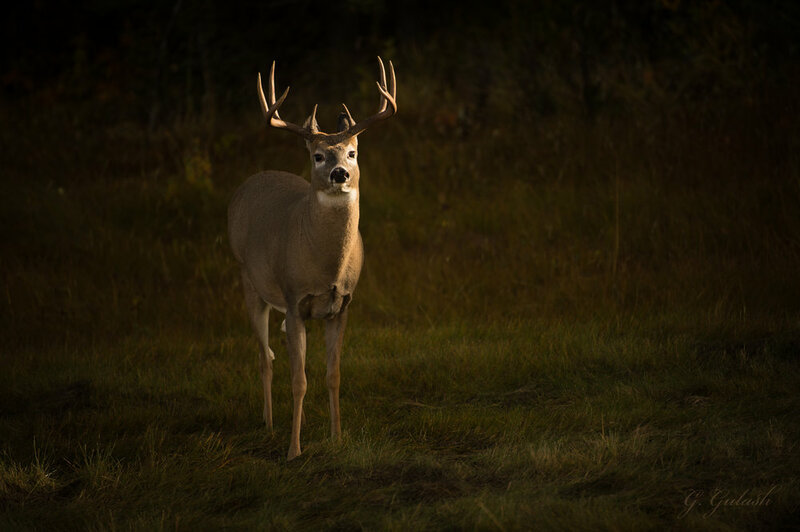 I again went for a low key approach to reveal the beauty in the deer and his environment. Additionally, I decided to apply a slight vignette to the image to bring attention and add drama to the majestic buck. So, don't be a slave to the "auto" mode of your fancy digital camera's meter, blow out some highlights, underexpose some stuff....I guarantee you won't hurt anything and you may find it liberating to be the master of your exposures. Your photos might get a few more oohs and ahhs as well.